Physical therapy is a unique science and art that utilizes a wide variety of procedures to restore function to the body, reduce pain and help prevent future injury. Our talented clinical team devise individualized treatment plans to achieve the specific goals of each patient. After an initial physical examination and diagnosis by a physician, patients are referred to TheraCare Rehab. At the first visit, patient undergoes an initial evaluation and an individualized treatment program is designed, in conjunction with the physician's prescription, to meet the patient's specific rehabilitative needs. Under the plan of care set by TheraCare‘s Physical Therapist, patient goals are established and treatment begins. 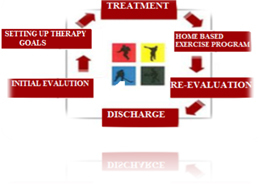 Various physical therapy modalities utilized during treatment and the complete treatment process may as explained below.